In his book Fishing: More Than a Passion—published this fall by the Write Place—Chiodo uses a mix of prose, poetry, and farce to explore the ins and outs of the sport he loves. He recounts the thrill of tournament fishing, delves into the psychology of fly fishing, and nostalgically describes his first fishing rod (a Coke bottle with a white string, heavy sinker and hook attached). The text is enhanced by black-and-white illustrations provided by Larry Anderson, an Iowa artist and friend of the author. Ben Chiodo grew up on the south side of Des Moines and currently lives in the town of Murray, Iowa. He has enjoyed fishing his whole life, as well as sharing the sport with others. As a member of Iowa bass clubs, Chiodo has participated in many fishing tournaments. Fishing: More Than a Passion is Chiodo’s first book. It is the second fishing book published by the Write Place. 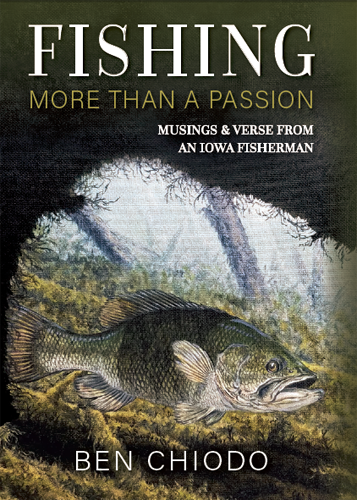 The first was The Reel Adventures of a Marion County Angler, a light-hearted memoir based on the fishing experiences of Jeff Rowland, an Iowa native and amateur angler who moonlights as a fishing guide. Both titles are available for purchase on Amazon and BarnesandNoble.com.